Way back on June 1 (about six weeks ago), Richard Templeton stepped aside as president and CEO of Texas Instruments (TXN) (he had stayed on as chairman). Templeton made way for Brian Crutcher to take the helm. Crutcher, who had been with the firm since 1996, had filled the role of COO since January of 2017. This morning, Richard Templeton resumed his roles as president and chief executive in addition to the his title as Chair. What happened to that other guy? Here we go again. Crutcher resigned last night. A statement made by the Dallas-based firm indicated that Crutcher had violated the company's code of conduct, and that these violations were related to personal behavior, not corporate strategy, nor operations. The shares have been volatile overnight and are now off of their "pajama time" lows. Along with this news, the firm had the foresight to release second-quarter earnings information (due July 24) alongside this negative news event. TXN posted profit of $1.40 per share (in line with whisper numbers) versus consensus expectations of $1.31. The firm also showed revenue of $4.02 billion (+9% y/y), which was up versus expectations of $3.95 billion. How troubling is this to a semiconductor industry still reeling from the exit of former Intel (INTC) CEO Brian Krzanich at that firm? (That one hurt) According to the Wall Street Journal, in May, Brian Crutcher had been asked at a conference what it was that he would bring to this company. Crutcher, ironically, mentioned "consistency." Well, those looking for consistency from Texas Instruments can thank their lucky stars that a leader such as Richard Templeton was ready and willing to resume his multiple roles in a permanent way on short notice. This is likely the larger reason that the shares sort of held their own overnight, more so than the early release of the positive financial data. Time to Pile Back Into the Semis? Good question. If you're like me, you hung onto partials across the space just to maintain a certain level of exposure amid a trade war with China. We all know that many of the most highly exposed U.S. corporates to China-based revenue streams are indeed semiconductor stocks. The banks seem to have gotten "earnings season" off to pretty solid start. They say that this sets the tone for the entire season. I say that they talk too much. Let's focus here. In truth, I have been trying to add to several of my holdings in the semiconductor industry group while maintaining technical discipline. If you read me often, then you know that I've never chased anything. Except for my pretty wife. As a sector, Info Tech is expected to post a solid quarter. I have been looking for a second quarter that posts year-over-year EPS gains for the S&P 500 of something in the area of 19% to 20%. Info Tech should see something closer to 25%. Within the sector, as an industry, semis and semiconductor equipment manufacturers are expected to place second to software (the cloud), and show gains of more than 30%. I would look for the industry to back this up with revenue growth of more than 15%. The bottom line is that earnings are historical. We know that the chips as a group have earned their keep. 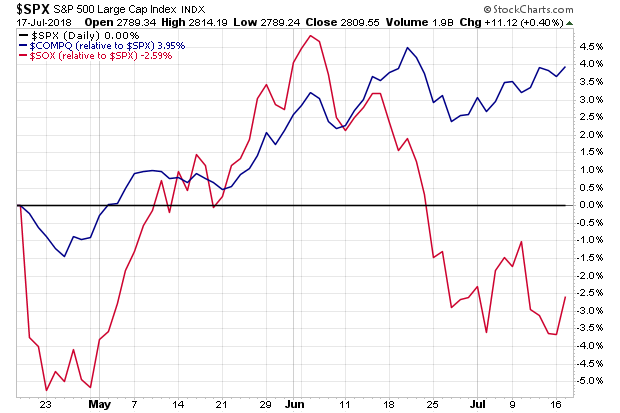 Over the last three months, the Philadelphia Semiconductor Index (SOX) has underperformed the broader market due to trade concerns with China. No other reason. Using the S&P 500 as a baseline, one immediately sees the overperformance of the Nasdaq Composite, and underperformance of the SOX versus the SPX over that time. Note: Performance is simply relative versus the S&P 500, not versus the starting point. The very first thing I notice is that China has been slow to retaliate versus the semis in this trade dispute. Yes, some of these names are highly exposed, but China needs them as much as they need China -- maybe even more so. This will not be a permanent condition. The Chinese government will speed toward a decreased reliance upon U.S. chips while dragging their feet on policy. China's aim was to be far more self sufficient by the year 2025. That's why intellectual property rights are such a hot topic. What can China do, other than impose increased responsive tariffs on the group? China, in case you have been living in a cave, is in a bit of a debt jam. Who isn't? However, should the Chinese government decide to devalue the currency, that would make imports more expensive, and exports less so -- while also making yuan-denominated debt easier to pay. Not a permanent solution to anything, but a weapon that a nation currently in over its head in a trade war might use. So, this is my plan. 1) Equipment. I got rid of Applied Materials (AMAT) as trade war tensions increased. Probably the best move I've made in the space. I have been trying to add to Lam Research (LRCX) and KLA-Tencor (KLAC) on the dip. From a trading perspective, LRCX has formed the best base. All three are highly exposed to China. Lam's earnings are due a week from tomorrow. I know of no CEO that lays it on the line as honestly as Martin Anstice of Lam. Until I hear his voice on that call, I will trade more, invest less. In the meantime, KLAC August 17 $100 puts still paid more than $2 yesterday. That name found support at the $100 and $98 levels on each of the last two dips. Just an idea. 2) Memory. Who doesn't love Micron Technology (MU) ? I know I do. Still I have my entire equity long covered through the sale of call options. What's that do? Raises revenue, while further reducing my already favorable basis. The risk, other than equity risk? The shares get called away. Still, even in that event, I ring the register. I have not touched Western Digital (WDC) , and am not sure I plan to. The name has been a real dog, and does not compare well to any other name in the group. 3) GPUs. The champ here? Nividia (NVDA) ? No, not so far this year. Intel (INTC) ? At least they pay you something for your equity stake. The champ is Advanced Micro Devices (AMD) . I can't boast here. Your old pal swung and missed 25% ago. That name has returned 64% on the year (really all since April). Just tread lightly. AMD does appear to have hit resistance, and all three of these names face high levels of Chinese exposure. NVDA is an Action Alerts Plus holding. 4) Left Field. There is only one chip stock that I have not sold a share of this year. Seagate Technology (STX) . The shares have gone sideways since March. Why own these? Two reasons: not a lot of Chinese exposure, and they pay me 4.3% just to own the shares. STX has always paid well, even in tough times. Oh also, they are exposed to crypto. Keep that in mind. Looking to initiate: AMD -- but I need my price. Looking to increase: LRCX, KLAC, MU, NVDA from current 50% of intended position size to 65% -- only at my levels, even if I whiff. Looking to decrease: INTC from 50% to 25% hopefully in mid $50s. Will consider adding upon new CEO designation. This article is already getting long. I'll be fast. WTI Crude is closing in on the $66 level (That I warned you about last Thursday) in the wake of last night's API data. If we see inventory data today that pressures the commodity, I become more likely to add to my exploration longs this afternoon -- Exxon Mobil (XOM) , Royal Dutch (RDS.A) , and Action Alerts Plus holding British Petroleum (BP) . 08:30 - Housing Starts (June): Expecting 1.32M, Last 1.35M SAAR. 08:30 - Building Permits (June): Expecting 1.33M, Last 1.3M. 10:00 - Fed Speaker: Fed Chair Jerome Powell testifies (House Fin Srvcs Comm). 10:30 - Oil Inventories (Weekly): Last -12.633M. 10:30 - Gasoline Stocks (Weekly): Last -694K. At the time of publication, Guilfoyle was long LRCX. KLAC. MU, NVDA, INTC, STX, XOM, RDS.A, BP equity. Short MU call options. Short BP put options.